I can hardly believe Breaduary is over. I have had a lot of fun trying different flours and baking all sorts of increasingly delicious breads. Practice really does help improve those skills. And it was actually much easier to do than one might think, given the amount of time you need to knead, prove and bake a loaf. But really, making bread only needs about 15 minutes of your attention, and the rest of the time it is doing its own thing. And to make life even easier, you can not only freeze bread (not my favorite, I think it dries out) but you can freeze your dough that is shaped into loaves or buns before the second rise. This way all you have to do is pull it out of the freezer, pop it in a loaf tin, let it thaw and rise, then bake. It takes less time than running to the store, and tastes 1000% better. So now there is no going back….fresh baked forever!! PS Keep your eye on our consumer page, all the recipes we use will soon be on there! PAN UK recently completed a study ‘Pesticides on a Plate’ to research the presence of pesticide residues in food in the UK. While their finding were unappetizing to say the least, what was even more disturbing was the lack of information that UK citizens have about the food they are consuming – 96% of consumers are unaware of the maximum levels of pesticide residues found in food. So why should organic cereal farmers be interested in Alex and his business model? Alex’s story is an interesting one. Clearly a man of principle who has developed his business in line with these principles and has found customers who support these values. Alex is now a significant buyer of organic oat flakes. But why is this important? It is important because every tonne of oat flakes is over one and a half tonnes of oat grain. It is important because Alex likes to know where his oats are sourced and takes an interest in his suppliers and he has taken the trouble to listen. He attended a meeting we held back in November. Listened to farmers’ need to have a stable market and has now placed an order for oats for the next two seasons. Great for him as he now knows who will be growing his oats for his delicious museli (Organic Rich Muesli is a personal favourite) and porridge products and great for the farmers who know they have a secure market for their grain. And just as importantly great for those thousands of consumers who like Alara as they will have the best quality organic oats for their breakfast for the next few years. We like this way of doing business: to understand our customers requirements, committing to supply them and work together to develop our respective businesses in partnership. 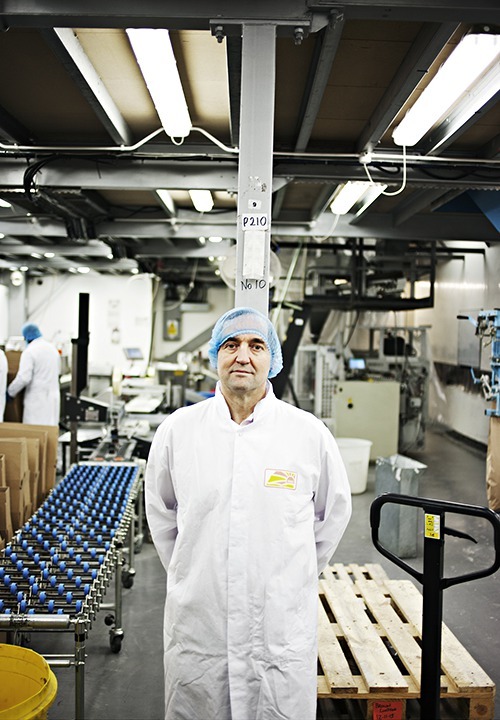 The muesli-maker who began in a squat | Behind the scenes | Life and style | The Guardian. Fragrant Orchids in bloom on Helen Browning’s organic farm in Wiltshire. Photo taken by wildlife photographer Elliott Neep. Our countryside has changed colour in the past century. Now mostly green or perhaps yellow with rapeseed (and more recently brown with flood water), it used to be a profusion of reds, blues, whites, yellows and purples when wildflowers bloomed in all their splendour. Agricultural intensification has been the reason for this change in palette – 97% of our wildflower meadows have been converted, weed-killers have obliterated the huge variety of wild plants (weeds) that insects and farmland birds depend on, and mixed cropping (used to control insect pests and break-up disease cycles), have been replaced with inorganic fertilisers and repetitive monocultures. The loss of all these flowers has had a devastating impact on our wildlife. A wildflower meadow was described in the early century as being chock-full with butterflies, thickly filling the skies above and stretching into the distance as far as the eye could see – a sight now which is hard to imagine. But there is hope. By supporting our work on organic farming, you are helping to bring some colour back. Organic farmers must maintain their flower rich meadows, and mixed cropping with clovers, peas and beans are still used as part of the farming system. Furthermore, organic farms use no weed-killers. The result? More wildflower habitats and more flowers within crops – and often around them too as there is no risk of dangerous chemical sprays drifting onto field margins from organic farms. Overall, research has shown that organic farms have on average around 75% more species of plants and a significantly greater coverage of wildflowers. What’s more, organic farms go some way to help species conservation as they have an increased diversity of rare species, such as the beautiful but endangered red hemp nettle and corn buttercup, and the rare but once common cornflower. So this is to say a great big thank you for those supporting our work on organic farming and helping to bring more flowers, as well as butterflies and bees back into our countryside. By Emma Hall. Published on February 21, 2014 . After four years of tumbling sales, organic food is back in favor with U.K. shoppers. Big spenders and younger, environmentally-conscious consumers pushed sales – which fell 12% in 2010 – back to 1.2% growth, according to Nielsen. At the U.K.’s largest supermarket, Tesco, organic banana sales were up 60%, organic feta cheese up 95%, and organic whole milk up 40%, while at rival Sainsbury’s, organic sales rose a full 7% last year. Organic food supplier Abel & Cole, which came close to collapse in 2009, reported a 24% increase in sales to $63 million for 2013. Even with the recession still biting and wage increases negligible, Brits somehow found $2.1 billion to pay premium prices for organic food. Last year’s horsemeat scandal provided the biggest wake-up call for shoppers, leaving them in no doubt that the constant scramble for lower prices had impacted supermarkets’ standards. Anxious new parents in particular have flocked to organic, which makes up 54% of all baby-food purchases, according to the Soil Association. On top of this, the Organic Trade Board ran a well-timed advertising campaign in 2013, sending out a message to consumers at a time they were prepared to listen. The campaign, by agency Haygarth, targeted London and the South East of England, where 70% of organic food and drink is sold. Nationally, the ads were seen on the websites of some of the biggest supermarkets – Sainsbury, Tesco and Ocado – where they produced a sales uplift of between 25% and 80%. Brands and retailers funded 50% of the campaign last year, and will do the same in 2014. It’s worth their while to attract organic shoppers who, according to Ms. Fookes, spend twice as much on groceries as non-organic shoppers. The European Union contributes the other 50% of the budget, which will total about $1 million a year in a six-year commitment that started with the 2013 campaign. Ms. Fookes believes that, as well as the horsemeat scandal, the small upturn in the economy last year helped to bring customers back to organic food. She said, “Our core committed shoppers never stopped buying organic. It was the dabblers who didn’t dabble so much. But now they understand the benefits more, and they care a little bit more – it’s on their minds about what they should eat. The beleaguered bumblebee faces a new threat, scientists say. Researchers have found that two diseases harboured by honeybees are spilling over into wild bumblebees. Insects infected with deformed wing virus and a fungal parasite calledNosema ceranae were found across England, Scotland and Wales. Writing in the journal Nature, the team says that beekeepers should keep their honeybees as free from disease as possible to stop the spread. “These pathogens are capable of infecting adult bumblebees and they seem to have quite significant impacts,” said Professor Mark Brown from Royal Holloway, University of London. 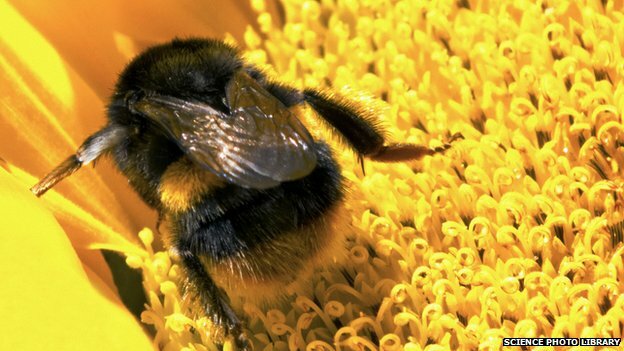 Around the world, bumblebees are doing badly. In the last few decades, many species have suffered steep declines, and some, such Cullem’s bumblebee (Bombus cullumanus) in the UK, have gone extinct. Scientists believe that the destruction of their habitats – particularly wildflower meadows – has driven much of this loss, but the latest research suggests that disease too could play a role. The researchers looked at two pathogens commonly found in honeybees and found they can also infect adult bumblebees. In honeybees, deformed wing virus (DWV) causes significant problems. Its severity seems to be exacerbated by the presence of another widespread parasite, the varroa mite, causing entire colonies to collapse. Bumblebees do not carry the varroa mite, but the scientists found that those infected with DWV had a dramatically shortened lifespan. The fungal parasite has also been shown to have an impact on bumblebee longevity. The researchers found the diseases were already prevalent among wild populations. Looking at 26 sites across Great Britain and the Isle of Man, the researchers found that about 11% of bumblebees were infected with DWV and 7% were infected with the fungus. By comparison, about 35% of honeybees carried DWV and 9% had the fungus. “A geographical patterning provides us with the information that transmission is occurring among these animals – they are sharing parasite strains,” said Prof Brown. 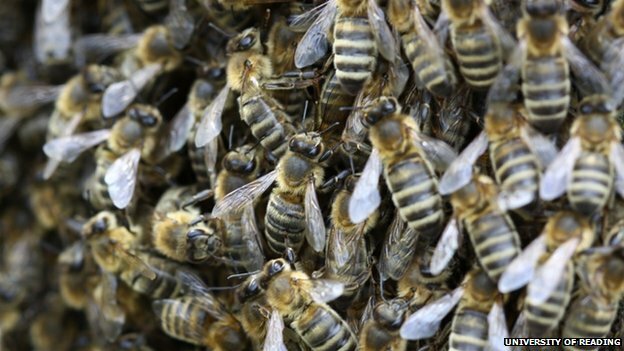 The team suspects that the same pattern will also be found around the world – and says that controlling disease in honeybee hives is vital to stopping the spread. “We have to, at national and international levels, support management policies that enable our beekeepers to keep their bees as free of diseases as possible,” Prof Brown said. The researchers also want to investigate whether neonicotinoid pesticides are playing a role in problem. A recent paper in the Proceedings of the National Academy of Sciences journal suggested that the chemicals are affecting the immune systems of honeybees, making them more susceptible to pathogens. “If bumblebees were exposed to neonicotinoids and had the same effect, you would expect the bumblebee viral load to be going through the roof. This is something we are hoping to test later,” said Prof Brown. 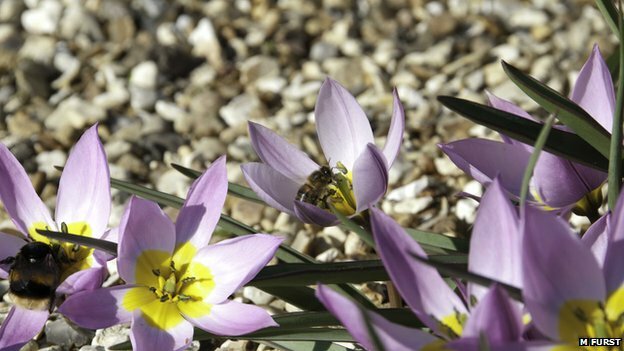 In the European Union, neonicotinoids have been banned for two years because of fears that they may be harmful to bees. But the British government strongly opposed the plan, rejecting the science behind the moratorium. Both Syngenta and Bayer, which manufacture neonicotinoids, are now taking legal action against the European Commission in an effort to overturn the ban. We had some lovely recipes we found for Valentine’s Day, and you can see them on our facebook page. As we head into the second half of the month I have been asking myself, “Okay, now that I have made all these loaves and rolls, what the heck can I do with them?” So this week I will be posting recipes for some scrummy sandwiches, tasty bier rox, enchiladas, and a few other treats. Keep your eyes peeled! How Dough I Love Thee? With delicious tear and share cinnamon rolls. Check out our facebook page for the recipe! Organic grain grown by Organic Arable members makes the best Organic flours for you and your loved ones. Ok, that’s a lot of organic for one sentence, but we do a lot of baking for families and ourselves so we feel we can say it with confidence. But if you aren’t in the mood for something quite so sweet, check our facebook page for the Baked Oatmeal to Go recipe, sugarless and made with delicious White’s Organic Oats. And you guessed it, our members supply those heart-healthy golden grains! The biggest ever review into whether organic farming benefits wildlife has taken place – and the findings are clear – organic farms have on average nearly a third more different species of wildlife. The researchers stated in the report that “organic methods could undoubtedly play a major role in halting the continued loss of diversity from industrialised nations”. Wow it has been a busy week. But a very tasty one! I am thrilled with the results and my family and neighbours are clamoring for more. Be sure to check out all the recipes we have posted on our facebook page. Two big standout winners for me are the Farmhouse wholemeal baps made from Prior’s Strong Wholemeal Flour from Foster’s Mill, grain supplied by our member Howard Roberts, and the handmade tortillas, made with Shipton Mill’s Organic Strong White Flour. Next week keep and eye out for our ‘How dough I love thee’ recipes.